Just a few days ago Google made a change to the algorithm to help improve the accuracy and relevancy of local results. To be clear, the algorithm was coined “Pigeon” by Search Engine Land and not Google, but the change happened nonetheless. When Google comes up with a name for the algorithm, we’ll update you right away. For now, the algorithm was significant enough to earn its own animal. Although we still don’t know how many companies were affected, we do know that it’s overall the local businesses seeing either increases or decreases in web site referrals and traffic. The idea is to offer local search results that are more closely related to some of the ranking signals they use in web search as well as other features like the Knowledge Graph, synonyms, etc. The algorithm change is also said to improve distance and location parameters, so local search should be more accurate overall. The update was officially launched July 24, so there has been a little bit of time now to really analyze what has changed and whether or not the update was significant. For local businesses it is significant, and fortunately in a good way. Local directories are specifically getting the most benefit out of the change. In the past when you would search for something local, you would get your carousel results and then a list of organic results, typically individual restaurants. 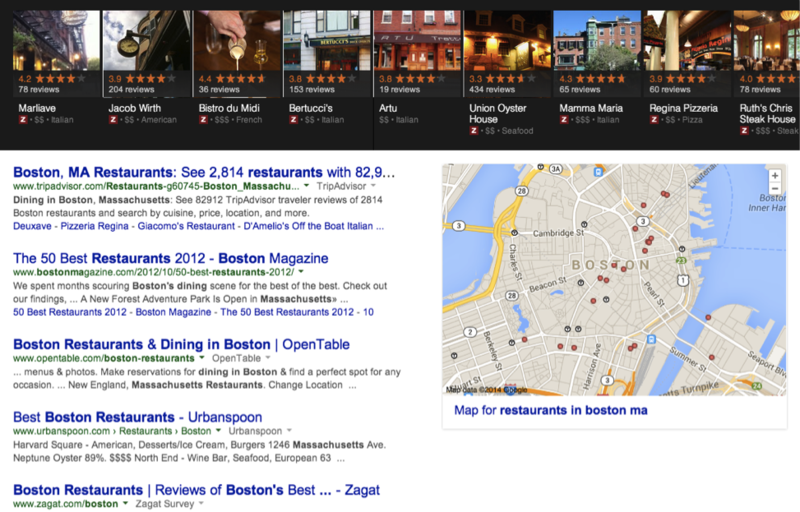 Now, you will sometimes see directories showing up in the search results below the carousel including OpenTable, Urbanspoon, and even TripAdvisor. This doesn’t happen with every search query, but we’re seeing it more and more so this may be a trend for the future (or something Google is trying). Again, this is only the case for some search results. It’s also worth mentioning that the Yelp ordeal has been solved with this change. Last week we reported about some of the confusion with Yelp and Google, essentially reporting that Yelp wasn’t showing up on search results even when the world “yelp” was used in the search query. In other words, Google was accused of putting their own local results first even when they weren’t the most relevant. Since the new update, this is no longer the case and Search Engine Land gives several examples here. As discussed above, if you’re a directory this is a good thing; however other local businesses may suffer. Keep in mind the goal of this algorithm update—to tie local results more closely to standard web ranking signals. With this in mind, it’s those sites that have solid and strong SEO signals that are going to prevail. Directories generally do outrank individual companies in this area, so local businesses are going to have to work harder to come out on top. Currently this update was only rolled out to US English results, and so far that’s about all we know. We don’t know when Google plans to roll this out to other countries (if at all), and we don’t know the percent of queries impacted. We’re hoping the details will come soon and we will keep you updated. In the meantime, check out your own metrics and let us know if you’ve seen any changes and what you think of the update. Google’s Penguin Update was Supposed to Clean the Web, Right?